Pack of 50 Clear 13 Dram Pop Top vials, which adhere to strict quality and compliance regulations. Pop Tops are CPSC certified and meet STM standards. Medical grade, and the most convenient way to store pills and other medications. To open the Pop Top bottles, firmly squeeze on both sides, which makes the "pop" sound. These bottles and vials produce a strong "pop," which shows the quality and tolerances of our vials. 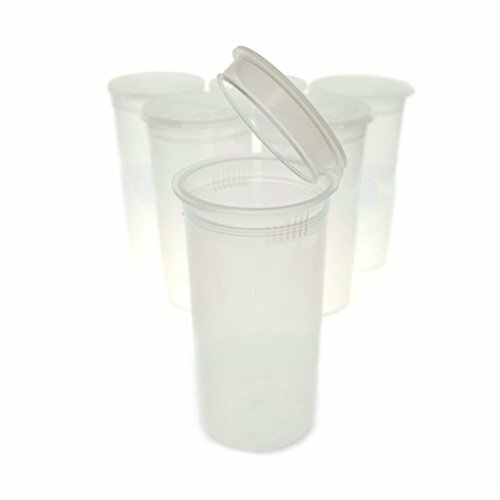 The medical grade plastic is BPA free and made of FDA-approved material! Great Price! Specifications: 13 dram - 2 grams per bottle. This is a one-piece plastic vial and snap closure attached with a Captive Hinge. Child Resistant Version. The CR package is opened by simultaneously squeezing two specific points on the plastic vial, which causes the snap closure to flip open. The squeeze points are located at the top of the vial and are 180 Degrees apart. Each squeeze point is designated by a set of 7 vertical ridges. Medical grade, and the most convenient way to store pills and other medications. To open the Pop Top bottles, firmly squeeze on both sides, which makes the "pop" sound. If you have any questions about this product by Van Cave, contact us by completing and submitting the form below. If you are looking for a specif part number, please include it with your message.